The Propeller is a microcontroller from Parallax, the same guys that make the Basic Stamp. It's available in a through-hole 40 pin DIP, is speedy (120MIPS), and goes for $8. This instructable will show you the basics of programming the Propeller. I'll show you how to do a basic 'blinky lights' type program and get you started with Video output. A Breadboard, resistor and LED for our sample program, and a power source (2x AA's will work). I used a 3mm green led and 270 ohm resistor. The Propeller can be programmed in many languages (C, Spin, PropBasic, Assembly, and others). I think most people use Spin, and that's my favorite language, so that's what this tutorial will cover. I'm using a 3mm green LED and a 270 ohm resistor. Spin is the most commonly used high-level language for the Prop probably because it's (1) easy, and (2) there's a spin interpreter on the Prop. There are other languages out there, but I figured I'd talk about Spin because it's the one I know best. These 2 blocks hold actual code. If you're familiar with php or BASIC or C, these operate a lot like functions. They have names (the name of this block is 'main'), and you can pass them values (function(passedval)). There are 2 more blocks, DAT and OBJ, but we'll skip those for now - OBJ is useful when incorporating someone else's code, and DAT is another place to hold variables, it's also where you put assembly code (if you want to use it). Every pin on the Propeller can be set to an input or an output. When the Prop boots up, each pin is set as an input, so we'll need to set P0 to an output. To set P0 as an output, we'll change the value of dira to 1. The := is an assignment operator in spin. Can you guess how you'd set P10 to an output? dira := 1. You can also change a range of pins with a single command. To change P0,P1,P2, and P3, just use dira[0..3] := 1.
repeat tells the Propeller to run a block of code multiple times. You can specify a repeat condition (repeat i from 1 to 100) or just repeat forever by not specifying anything else. This repeat block will repeat forever. Code to be repeated is delineated by tabs. Note the soft gray lines under the repeat block? The Propeller Tool put those gray lines there to show you what code is in the repeat loop. outa tells the propeller to connect the pin to ground or to V+. outa works just like dira, you can set the output of a single pin (outa := 1) or a group of pins (outa[0..3] := 1). Note that outa is only meaningful if the pin has been switched to an output with dira. Further, the Propeller uses Tri-state logic. Each pin can be connect to ground, V+, or set in a high impedance state. A high impedance state lets the pin sense whether it's connect to ground or V+ without changing the signal. 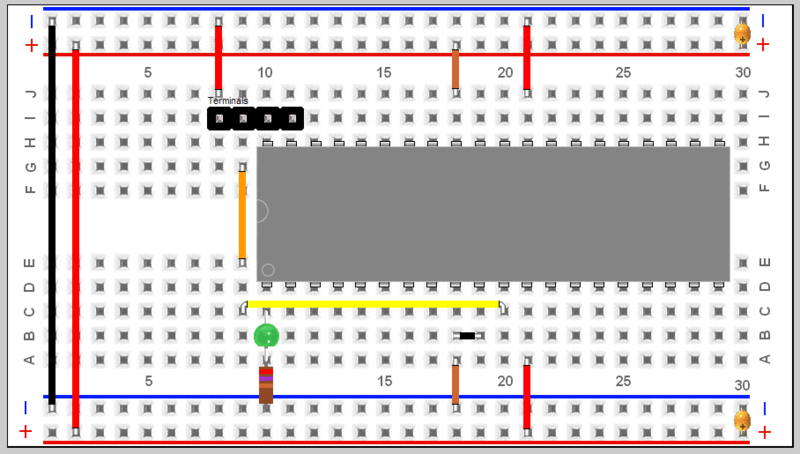 It lets multiple pins share the same data channel and do stuff like charlieplexing. ina works just like outa and dira, except it's read only. If the pin is set as an input, ina will hold the current input value. The Prop can run at multiple clock frequencies, from 20kHz all the way to 80MHz. clkfreq is a system variable equal to how many clock cycles (ticks) are in 1 second. If the Prop is running at 80MHz, clkfreq will = 80,000,000. If the Prop is running at 20kHz, it will = 20,000.
cnt is the system clock. On bootup, cnt = 0 and it increments on each tick all the way to 2³² before rolling over to 0. cnt is a read-only value, you can't change the system clock, just read what it is. Now, waitcnt: It pauses program execution until the system clock reaches the value in the parenthesis. What is the value in parenthesis? The current system clock (cnt) PLUS the number of ticks in one second. waitcnt(clkfreq + cnt) tells the prop to hold up for 1 second before going to the next instruction. This instruction flips pin 0 from being connected to V+ to being connect to ground. It turns the LED off. 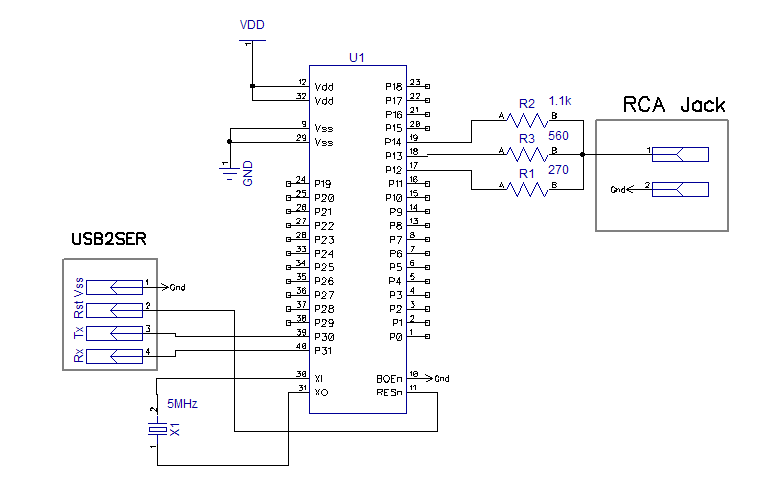 Note that pin 0 is still an output, but it's connected to ground. Just like last time, it pauses program execution until the system clock equals the value in parenthesis. In this case it will pause exection for one second. The final instruction in our repeat loop has completed. Because our repeat loop has no end condition, it will start again on the first line (outa := 1) and keep running indefinitely. Let's clean up our code with a few operators. Note that these operators won't change what your code does, they're just shortcuts to make it easier to read. The ~(single tilde) sets the preceding variable to FALSE. The exclamation mark flips the value of the succeeding variable. If it's set to TRUE, it will be be flipped to FALSE. Often, it's referred to as 'toggle' because that's what it does. There are a lot of operators you can use in Spin, ++, --, comparisons, max and min's, and so on - check the Propeller Manual starting at page 42 to see all of them. A 5MHz crystal on pins 30 and 31. The Propeller needs some speed and precision to generate video data, the Prop will take that 5MHz input crystal and multiply it by 16 for a 80MHz clock speed. This constant tells the Propeller what clock speed it should run at. 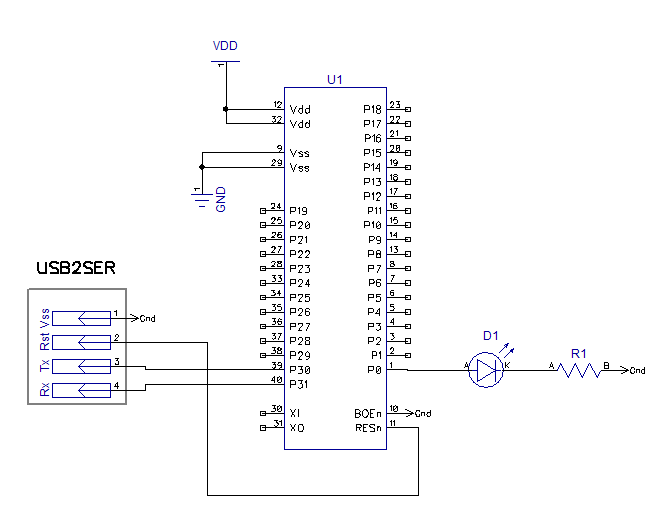 If you don't specify anything, the prop will use an internal oscillator to run around 20MHz. This setting (xtal1 + pll16x) tells the Prop to take the crystal frequency and multiply it by 16. Take a look at the Propeller Manual for other valid clock settings. If you're using a clock speed that uses a crystal, you'll need to tell the Prop how fast the crystal is! setting the _xinfreq to 5_000_000 tells the prop that the crystal frequency is 5MHz. NOTE: in Spin, underlines (_) are disregarded, so people often use them to make reading large numbers easier. The obj block tells the compiler: "If I refer to a method (PUB or PRI) in another file, this is where you should". I'll reserve a full discussion of using Objects for another instructable, but for now, just think of Objects as a way to include other code. The code we're using here comes with the Propeller Tool. tv_text is code to start a TV and display simple text information on it. There are a TON of other objects available on Parallax's Object Exchange, too. This is the main block of code. text.start refers to the PUB start method in the text object. It starts up the TV and reserves memory for the screen. text.str refers to the str method in the text object, it uses the Propellers built-in font to display a text string. We use the string() function of spin to declare the text string to display. That's it! There are other TV display objects available. The graphics demo (included when you download the Propeller Tool) includes methods to display text, color, and graphics, a screenshot is below. You can also download the graphics demo on the Object Exchange. We walked through a blinky light program in Spin, and I gave you a quick overview of generating video, but there's a ton more the Propeller can do! Multitasking - Our blinky light program only used 1 core, but there are 7 other cores at your disposal. Object Oriented Programming - Spin is an 'OOP-lite' language, and code re-use is straightforward. Objects have already been built to control and read sensors, servos, motors and a bunch of other devices. Advanced Graphics and Audio - MIDI & wav file playback, graphics and games. I hope you've found this instructable helpful in getting started with Propeller programming. If you've got any feedback or questions, let me know! Just add your comment to this instructable. I am just starting on parallax wondering which way, and this got me starting. Thanks!